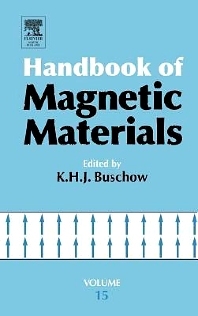 Volume 15 of the Handbook on the Properties of Magnetic Materials, as the preceding volumes, has a dual purpose. As a textbook it is intended to be of assistance to those who wish to be introduced to a given topic in the field of magnetism without the need to read the vast amount of literature published. As a work of reference it is intended for scientists active in magnetism research. To this dual purpose, Volume 15 of the Handbook is composed of topical review articles written by leading authorities. In each of these articles an extensive description is given in graphical as well as in tabular form, much emphasis being placed on the discussion of the experimental material in the framework of physics, chemistry and material science. It provides the readership with novel trends and achievements in magnetism. Professor Kurt Heinz Jürgen Buschow is a member of the Experimental Physics Department of the University of Amsterdam, where he teaches Magnetism and Magnetic Materials. He studied Physical Chemistry at the Free University of Amsterdam, starting in 1954. After having received his M.Sc. degree in 1960 he prepared his thesis work dealing with “Ion-pair Formation with Polyacene Mono and Dinegative Ions”. He received his Ph.D. degree at the Free University in 1963. In 1964 he held a research position at the Philips Research Laboratories in Eindhoven. He was appointed Senior Scientist in 1976 and Chief Scientist in 1988. His research activities comprised fundamental as well as applied aspects. During this period he stayed for one year (1977) as a guest scientist at the Bell Laboratories, Murray Hill, N.Y. In March 1994 he left the Philips Research Laboratories, taking a position at the Van der Waals-Zeeman Institute, University of Amsterdam and having simultaneously a part-time professorship at the University of Leiden. His teaching activities are in the field of Metal Physics and Magnetic Materials. He has published more than 1100 papers in international scientific journals and is author of several review papers and handbook chapters on magnetic materials, metal hydrides and amorphous alloys. He is Editor-in-Chief of the Journal of Alloys and Compounds, Advisory Editor of the Journal of Magnetism and Magnetic Materials and is also Editor of the Series Handbook Magnetic Materials. Recently he became one of the Editors-in-Chief of the Encyclopedia of Materials: Science and Technology.